← Blairsville’s Own Adventure Race! So you want to run the Blairsville Extreme Adventure Race, huh? That’s awesome! But you don’t know a thing about Orienteering… No worries! We will get you started in the right direction to learn everything you need to know by the time the race comes around in September! In this post we will only cover the basic the basics but you will fins several resources to further your knowledge. 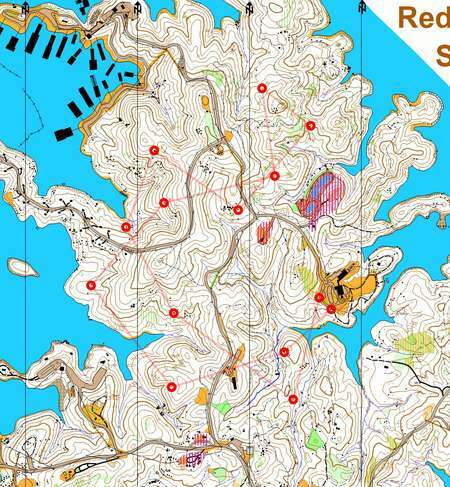 For orienteering, you need a detailed topographic map of the surrounding area (example) and a baseplate compass. Be familiar with the compass, its working parts and how they work with the map. If you are not sure about the different parts of a compass and want a quick and easy introduction, watch this short video that makes remembering the names and functions for compass parts easy. After knowing the parts of your compass, familiarize yourself with your map. In a race like the BEAR, the map given to you is a special map of the area with stating point (marked by a triangle) and ending point (marked by a circle within a circle). Every adventure race has several “control points” (each within a single circle). A control point is a stop along the race route that is both easily identified on a topographic map and is highly visible. In an orienteering race, participants travel from one control point to another using their map and compass and collecting proof or signing in, signifying that they reach each control point between the start and finish of the race route. The triangle indicates the beginning point of the race. The circle within a circle indicated the ending point of the race. This example race starts and ends at the same location. The numbered circles are each a control point along the race route. To get started, hold your map and compass parallel to the ground with the compass flush to the map. Align the orienteering lines of your compass with the line between the starting point of the race and your first control point. Then, make sure the North arrows on your map are pointing in the same direction as the North arrows on your compass. This will require you to spin around until the two are aligned. This action is called orientating the map. The video below demonstrates this process. An adventure race is completed by traveling from one control point to another in this way. Of course, there is much technique involved in being a proficient orienteer. This is merely your basics to get started. Here are a few tips and tricks that will make learning a little bit easier as you go. Plan Your Route: The quickest way to anywhere is a straight line, unless that straight line involves steep assent when you are already worn out. Study your map to look for quicker, easier ways from one control point to another depending on your needs and the terrain. Know Your Map: The less you have to look back at your map, the more time you save. Study major features that will be helpful to you and don’t pay attention to tiny details on a busy that will not be used. That being said, don’t forget to check your map often enough to maintain a good sense of where you are. Don’t Go It Alone: The consequences of making a mistake while learning orienteering can be massive if they happen in a remote location. Take an experienced orienteer with you on practice runs. If practicing alone, practice in well known and inhabited places like your neighborhood or a local park. For further resources check out Orienteering USA’s page on Getting Started. For a good practice run before the BEAR, look into the Georgia Orienteering Club’s list of Permanent Courses. Several state parks in Georgia have orienteering courses with all the maps needed for a practice run.